Jiangsu Suning are a Chinese Super League footballing side who are based in Nanjing, Jiangsu. In 1994 they were one of the founding members of China’s first fully professional league, but suffered relegation in that year. 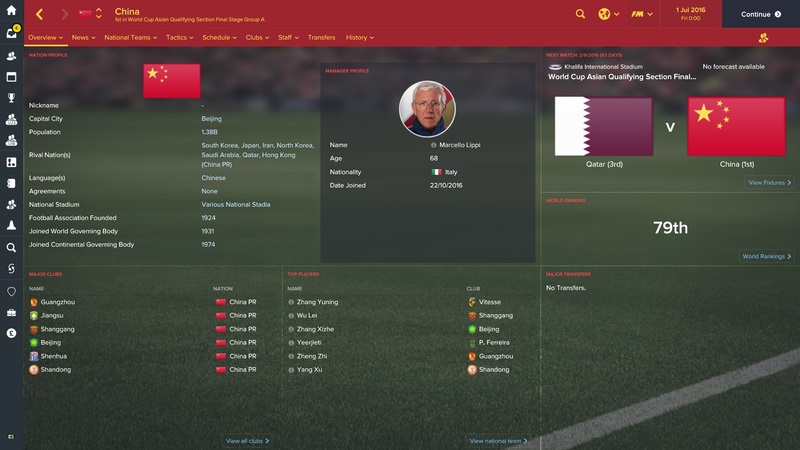 In Football Manager you will take on a team that came runners-up in 2016. They have a strong squad already, but with the money being invested in Chinese football you could easily improve your squad and challenge for the Super League short term. Bear in mind that you may need to change the start date of your game. 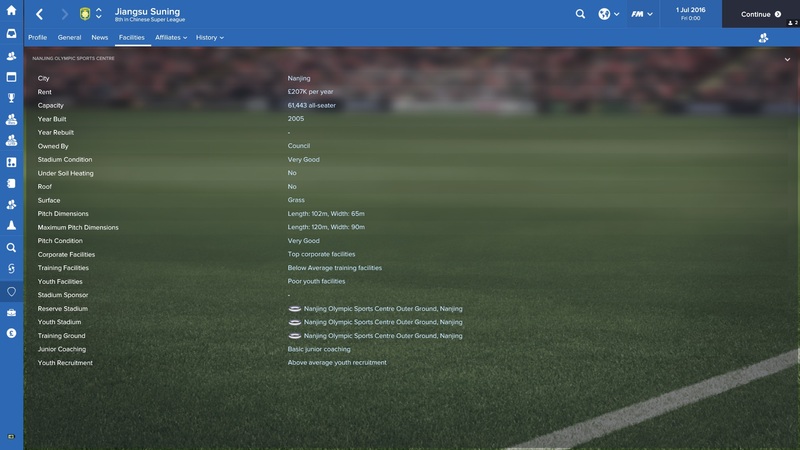 If you begin in July 2016, as I have for the below screenshots, the Chinese league will already be underway. Colombian Roger Martinez is a decent player in your squad. However, with a value of £20.5M and potentially better foreign players available you may wish to cash in on the striker sooner rather than later. 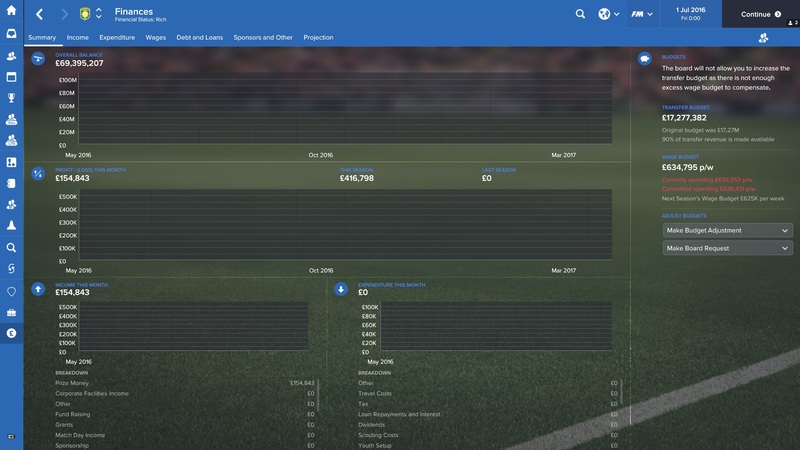 Having said that, he is on considerably low wages and is by no means a bad player to have in your squad. 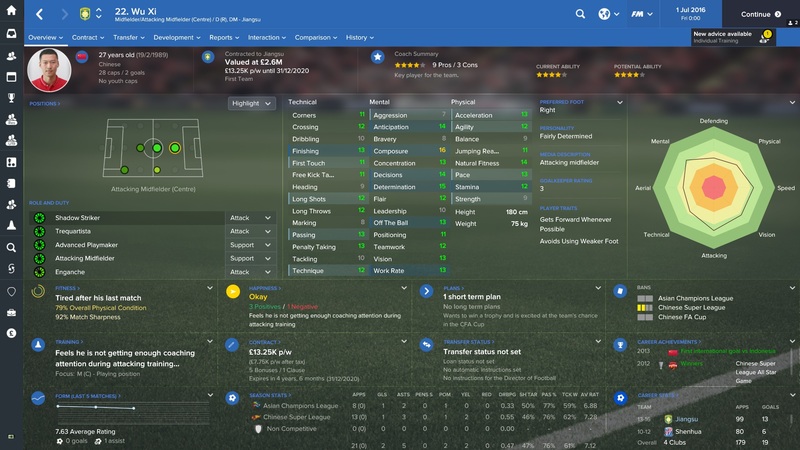 He will score goals for you with his high finishing, off the ball and composure. Brazilian Alex Teixeira is the star of the show for Jiangsu. He is a flamboyant attacking midfielder that should contribute heavily in both goals and assists. His high wages are worth keeping an eye on, but Jiangsu are rich. They can afford it. Like Teixeira, ex-Chelsea midfielder Ramires is on very high wages. The 29 year-old is a very good player and will dominate the midfield for you in many matches. Ramires will run all day for you, make sure his roles suits his high physical attributes. Unfortunately Jiangsu do not have many worthwhile hot prospects to speak about. With the restriction of foreign players it is vital to have good Chinese players in your squad. Here we will look at three of your better Chinese players. Wu Xi is your best Chinese player. He can play in all three central midfield positions but naturally plays as a shadow striker. Where you deploy him will depend on your formation, but at 27 he could be in and around your first team for the foreseeable future. Li Ang, capped by China, is a strong presence at the back for Jiangsu. At 22 he has many years to develop his skills and learn his game. He could be your leading man at the back for years to come, at least until a better newgen comes along. Defensive midfielder Zhang Xiaobin has attributes that would look good on a centre back. Perhaps it would make sense to retrain him. At 188cm tall he lacks the mobility to perform well in the DM position but would make a very good addition to the back line. Clearly your facilities need a lot of improvement. Did you really expect anything less? Jiangsu, like most Chinese clubs, are rich. Enjoy the freedom to spend as you wish. Although you will be competing with the various other rich Chinese clubs, it should be fairly easy to build a squad capable of winning the league (and the Asian Champions League too). But the real challenge here is to build a homegrown Chinese team. With the money being invested in Chinese football, you could look to continuously improve your facilities and improve the quality of newgens coming through the academy. Could you make the Chinese national team into a world superpower by increasing the number of quality Chinese newgens? Thank you for reading our club guide to Jiangsu Suning. I hope it may have inspired you to begin a save with the rich Chinese club. 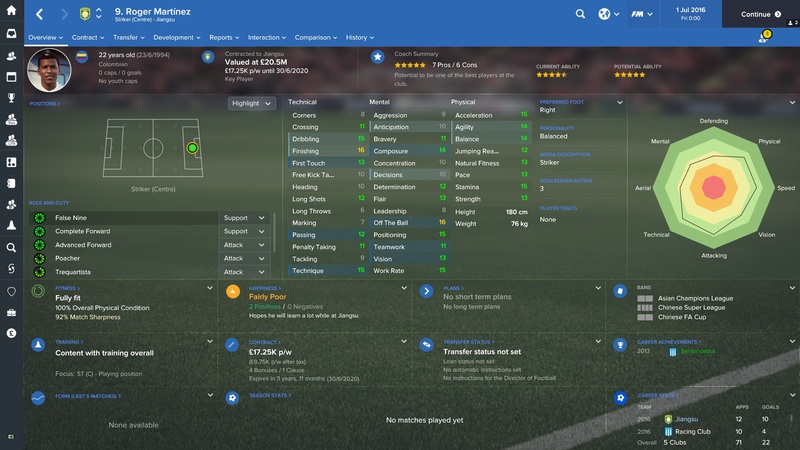 This entry was posted in FM Guides, FM17 Guides, Experiments & Wonderkids, Football Manager 2017 and tagged alex teixeira, asia, china, chinese super league, FM Guides, fm17, football manager, jiangsu, li ang, ramires, roger martinez, wu xi, zhang xiaobin. Bookmark the permalink.